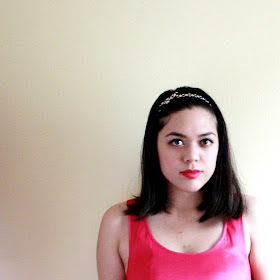 Here's what I wore to the 365 Hangers Style-a-thon event in my last post (oops. You can see my slip in a few of the photos--better than the alternative though). This is my favorite favorite dress--I've worn it so much already that the little heart prints are starting to fade (ack! ), but whatever. I always stalk Dahlia dresses on their website, and ASOS too, to see when they're going on sale. Also, It's a good thing I took these photos when I did--it started sprinkling, then raining heavily right when I was finishing up! The weather is so unpredictable sometimes. Oh, and be sure to follow me on Pose and Instagram (my username is sweetsandhearts). I'm quickly becoming obsessed with both. As for my iPhone, I love it, but I sure miss having real buttons to press. I can't seem to type anything in it without making at least one mistake. Completely irritating. I suppose there's a learning curve to any of these new things though!